It's not like Denon to sell on price, well, not a low one anyway. From the company that brought us the £13,000 AVP-A1HD AV pre-power amplifier system comes its latest 'affordable', fully-featured, Profile 2.0 budget-busting Blu-ray player, the DBP-1610. Unfortunately, at £400 it costs the same as two PlayStation 3s. Is it twice as good as said gaming console box-of-tricks? Not if you want top-notch game-play, websurfing and an occasional movie in passable quality. On the other hand, if you want smooth-as-silk pictures and high-quality cinema sound with every Blu-ray or DVD you play, then it's game over for the PS3. The DBP-1610 is a barnstorming Blu-ray disc-spinner packing in high-quality DVD upscaling, DivX HD and AVCHD support, and a front SD card slot for BD-Live material. There's decoding for Dolby TrueHD and DTS-HD MA audio formats, but this is only output over HDMI and not analogue 5.1 outputs – if you have a non-HDMI amp this isn't the baby for you. The Ethernet connection also allows over-air firmware updates, which our sample needed and executed with consummate ease. 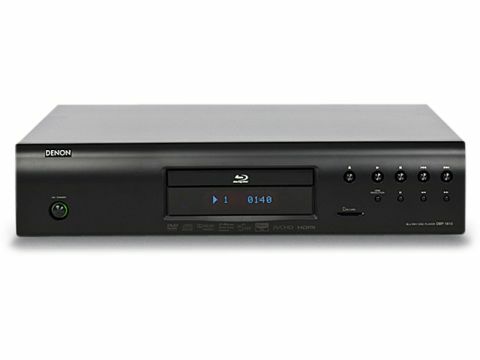 Denon-esque touches that elevate this player above the mainstream include independent block design to separate critical audio and video signals from RF-noise-generating devices like the power supply, and 24bit/192KHz DACs. You also get an independent analogue stereo output, fed from sassy Burr-Brown audiophile DACs should you have a high-fidelity musical inclination. Straight out of the box, this is not a deck that will sear your retinas. What the DBP-1610 is all about is accuracy and detail – and it does both with an easy gait. First off, you are going to think the picture is maybe a bit bland and reach for the controls – but resist. Navigate the sometimes sluggish menus and watch a movie first to appreciate what the DBP-1610 does best. With I Am Legend on BD, New York's early morning sunshine has a warm, realistic feeling. The smooth and muted colours of the desolate cityscape are beautifully crafted, and big-scale scenes pan absolutely seamlessly (the PS3 makes this scene look like the camera dolly is running on square wheels). And then wham, the poppy-red Shelby Mustang bursts onto the screen with deep, deep colour depth and a sound to savour. The roar of its engine and deep bass effects are punched out with true Denon-level accuracy and pace, which does wonders for the adrenaline-fuelled deer chase scene. Overall, DBP-1610's presentation is certainly a little darker and moodier than its more upfront and in-yer-face competitors, but it does foreboding tension with breath-holding precision. A slight loss of fidelity in shadows and a little bleaching in very bright areas let you know this isn't one of the £1,000+ super-players, but at £400 it's a real delight.